Coal Mining – Hibbs ElectroMechanical Inc. The mining industry brought Hibbs Electromechanical into existence. Hibbs has been servicing the mining industry since 1947 so you know we’ve got the expertise to keep your mine equipment functioning at peak performance. When you need to keep downtime to a minimum, Hibbs is your best resource. Hibbs ElectroMechanical has a large inventory of exchange motors for Joy, S&S, DBT, Fletcher and other manufacturers. 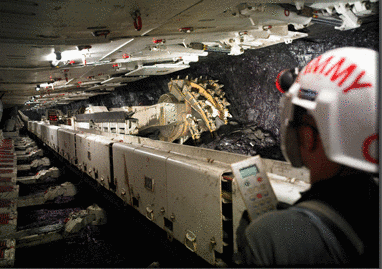 From traction motors to beltlines, Hibbs has kept mines operating for more than 60 years. Hibbs’ standard of quality ensures the highest quality repair in the shortest amount of time at a competitive price which adds an unprecedented value added service to our customers. Our high quality of repair means that all explosion proof motors are checked for permissibility and adhere to MSHA standards. When your motor leaves our facility you will have peace of mind knowing that your repaired component has been thoroughly inspected and tested. So if you can’t afford to have a piece of mining equipment or beltline grind to a halt, Hibbs keeps these and other electromechanical components running smoothly, not only with repairs, but with proactive and preventive maintenance. Call today and let us set up a plan for you. Hibbs stocks a large inventory of new Baldor-Reliance severe duty motors that are specifically built for mine duty applications. Hibbs helps keep the Reliance name synonymous with the mining industry by being one of the Midwest’s largest distributors and authorized repair facility. The cost of electromechanical component failure at a surface mining operation can be staggering. Hibbs helps prevent such breakdowns by keeping components in peak condition. From prep plants to draglines Hibbs’ high quality repairs ensure performance and keeping downtime to a minimum. Hibbs stocks a large inventory of new Baldor-Reliance severe duty motors that are specifically built for mine duty applications. Hibbs has been repairing DC motors of all sizes for over 60 years. Our vast experience in repairing DC Generators and MG Sets makes us a valuable resource to keep your dragline motors running at optimum performance. Call today to schedule an appointment and start moving your equipment on a successful path.